Want to have an estimate of the charges likely to be part of the offer of contract between Mr Hardy and his patients? Want to know your rights as a patient? Problems with your Private Medical Insurance? Would you like a link to the organisations that Mr Hardy recommends like the GMC, BMA and FIPO? Do you want to see a draft copy of the Surgical Fees Letter Mr Hardy's secretary sends to patients? Mr Hardy is frequently asked by colleagues about the high standards he sets in his Private Practice. Patients need good doctors. Good doctors make the care of the patient in front of them their first concern. Good doctors are competent, keep their knowledge and skills up to date, establish and maintain good relationships with patients and colleagues, are honest and trustworthy, and act with integrity. Mr Hardy has recognised over many years in clinical practice that when doctors are forced to care for too many patients at one time they frequently fail to be good doctors to any of them. This applies both in Private Practice and the National Health Service. The standards, set out on the right, are based on the GMC guidelines for "Good Medical Practice", common sense and the standards set during his training to become a Consultant in Orthopaedics and Trauma. Mr Hardy recognises that are three health care markets. The NHS, the Private Medical Insurance Market and those patients who can afford to Self Pay. Mr Hardy strives to provide a service better than you will receive in either in the National Health Service or for patients referred by their Private Medical Insurers to doctors contracted to fee assured low prices with insurers. Mr Hardy gives his private patients an up to 30 minute consultation, for new and follow up patients, at a fixed fee for the appointment. Thirty minutes because it is his opinion that patients have the right to understand the process of management (diagnosis and treatment) of a presenting clinical symptom or sign. Mr Hardy says that with musculoskeletal pathology a fifteen minute consultation is not enough to fully assess the present problem, implications of comorbidity, the options available for treatment and the risks and benefits of each option. Mr Hardy has put together an effective team with a demonstrably low complication rate according to accurate datex figures in the hospital he works in. He subscribes to the Royal College of Surgeons "The High Performing Surgical Team" Best Practice 2013. John will always make the care of the patient his first concern. This contract of care comes with responsibilities for both Mr Hardy and the patients. The patient's responsibilities are outlined in the FIPO Patient Information Leaflet. Mr Hardy is able to respond to private patient's needs rapidly as he is in full time private practice. He does nothave to take time off from an NHS post to look after his private patients. This compares favourably to when he was running clinics in the NHS of 50 or more patients and operating lists of 5 or more patients. Mr Hardy and his team are now more available to care for his private patients needs. He always provides his mobile telephone number, secretary's and hospital contact details to post operative patients for timely and easy access to his team. Mr Hardy is ready to protect and promote the health of both his patients and the public. An example of this is the care and effort he goes to to predict and prevent Surgical Site Infection. Mr Hardy keeps his professional knowledge and skills up to date by teaching and attending conferences and meetings. After his many degrees, qualifications and years of training Mr Hardy is able to recognise his own strengths and will only work within the limits of his competence. He also makes every effort to recommend only those colleagues he has personally trained or worked with in the ways that best serve patients' interests. Mr Hardy has had 34 years in which to develop the skills required to treat patients as individuals and respect their dignity. Mr Hardy attributes his successful practice to his ability to not just listen to patients but check that he has taken an accurate history by dictating the consultation infront of the patient at the end of the consultation. This allows for corrections to be made before they are committed to the medical notes. Mr Hardy will always respond to his patientsconcerns and preferences. He believes patients have a right to share in information regarding their condition and in decision making. Mr Hardy will always give patients the information they want or need in a way they can understand. Patients frequently notice that Mr Hardy uses analogies to explain some of the more complex concepts that need to be understood for valid consent. Mr Hardy has always respected a patients' right to reach decisions with him about their treatment and care. Mr Hardy will help support patients in caring for themselves wether they require conservative or surgical treatment. 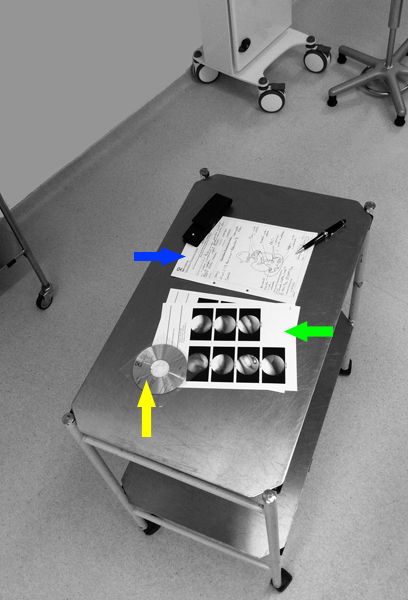 The image to the right shows the operative information Mr Hardy collects for each patient including the written operation notes with diagrams (blue arrow), the pictures taken during the operation (green arrow) and a video of the operation (yellow arrow). This standard of information feedback to patients is not availble to NHS patients at present. Another example of this is the access to alternative treatments his team have provided with educational information regarding the appropriate Braces and Supports for many conditions to improve and maintain patient's health. Mr Hardy is careful to act without delay if he has good reason to believe that he or a colleague may be putting a patient at risk. For example he and his team are always careful to review the investigations he has ordered personally. Mr Hardy runs a weekly management meeting with his Consultant Radiologist colleagues in London and Bristol to review the radiological and MRI investigations he has prescribed. Mr Hardy never discriminates unfairly against patients or colleagues. Mr Hardy is careful to never abuse his patients' trust in him or the publics' trust in the profession. Many operations are usually carried out under general anaesthesia as a day-case procedure. As a team Dr Coates, Consultant Anaesthetist and Mr Hardy, Consultant Orthopaedic and Trauma Surgeon offer an appropriate anaesthetic and good pain relief. Mr Hardy and frequently his physiotherapist will always review his patient post operatively first in the recovery ward and secondly when the patient has returned to their room. The review before discharge is to explain how the procedure went and what the post operative plan of rehabilitation includes. Patients who smoke do not just risk lung diseases and cancer. There is plenty of evidence that smoking delays fracture healing following scaphoid fracture, open tibial fracture, compound fractures, osteotomy of the forearm and shin bone fractures. Happily, if you stop smoking then fracture healing is improved according to a Finnish study. So if you are a smoker and are about to undergo Orthopaedic or Trauma Surgery then stop at least 2 weeks before surgery and use the excuse to give up or accept the increased risk of complications after surgery. Many studies have shown patients choose convienience over quality. This is because it is difficult for a layperson to recognise quality of care. However, given the finite resources in the NHS 83% of patients would prefer to see a Consultant and go on a waiting list than wait to see a Consultant but have the opportunity to be operated on rapidly. Mr Hardy is happy to see patients who choose to pay for their own treatment (self pay), insured patients with full cover, insured patients with partial cover and patients with co payment insurance. Patients with medical insurance can be rest assured that Mr Hardy is an independant private medical practioner not contracted to provide care by any one insurance company or hospital. Mr Hardy's office will always inform patients of his surgcal fees in writing prior to all but emergency surgery for all patients with limited reimbursement on their Private Medical Insurance. Please note: Mr Hardy is unable to see patients with UK BUPA, UK Pru Health or UK AXA insurance as these policies will not meet his standard fees or allow Mr Hardy to claim the shortfall from these customers. All other insurance and self-pay customers are welcome to see Mr Hardy. Patients are recommended to check their insurance policy prior to proceeding with any treatment offered to verify the level they are covered under their own private medical insurance scheme, and to check the level of excess payment under the terms of their policy. The Independant Doctors Federation (IDF) have recently published a Federation of Independent Practitioner Organisations (FIPO) Patient Information Leaflet pointing out that All Bupa subscribers should understand that Bupa, the private medical insurer, has recently altered the way in which it deals with certain subscribers when they seek consultant treatment. Patients choosing to pay for their own treatment will be expected to settle their consultation fees on receipt of an invoice from Mr Hardy’s office. Should any of Mr Hardy’s patients require surgery, payment will be required prior to the date of surgery. Mr Hardy’s secretary will contact you by letter and telephone to arrange this with you. Mr Hardy has always been transparent with his fees schedule which represent a fair and reasonable price when comparing his fees with colleagues of equal stature internationally. For more information on our outpatient fees please check our Surgical & Anaesthetic Fees for 2018. Paying for treatment directly through one of our hospital self pay schemes. Private Medical Insurance (Personal or company paid medical insurance policy e.g.WPA, Cigna). Cash Plans (Cash plans pay out contributions towards hospital treatment). Details of cash plan schemes can be found on the British Health Care Association (BHCA) website, the trade body for the majority of health cash plans and associated plans). Employer Assisted Schemes: (Employer Assisted Schemes are used by employers who recognise that in certain circumstances it is more economical for them to fund private hospital treatment, than to fund your sick pay and pay someone else to do your job, whilst you are awaiting publicly funded hospital treatment). There are at present three levels of Medical Care a patient can expect. There should be only one standard. The quality of care depends not on the government in power, health minister, department of health, practice premises, hospital premises, administrative staff or even nursing staff. It depends on the doctors. It is the responsibility of the doctor to manage your diagnosis and treatment and that means the doctor should be safely managing the resources available to him or her. A doctors most valuable resource is their time. Any doctor cajoled into managing too many patients for a defined resource will not be able to provide proper management. The Best Doctor is the one that allocates the time needed to provide the patient infront of them with a gold standard of care. England was clear and supportive over this matter of distant second opinions. Please read the FIPO May 2012 Newsletter. The growth of Private Medical Care is now in the self pay market. The professional organisation for Orthopaedic and Trauma Surgeons in the UK the British Orthopaedic Association have recently addressed the attempts by BUPA insurance to regulate knee arthroscopy and prevent some of their customers from receiving reimbursment against arthroscopic surgery. "At a meeting of the BOA Patient Liaison Group on the 20th June 2011 the Group discussed the BUPA initiative on arthroscopy and expressed the opinion that BUPA is putting at risk the integrity of the doctor/patient relationship by proposing a 'distant' review scheme. The Group further feels that a system of reviewing a course of treatment recommended by a qualified surgeon on the basis of the patient's medical needs by someone who has no knowledge of the patient and his/her particular situation is not in line with best clinical practice". Good Medical Practice "sets out the principles and values on which good practice is founded; these principles together describe medical professionalism in action. The guidance is addressed to doctors, but it is also intended to let the public know what they can expect from doctors" is elucidated by the GMC. Mr Hardy recommends that if you are insured with an insurer that is not fufilling the contract that you agreed with them then you should always contact the Financial Ombudsman. Please read the BOA advice on how to contact them in case of a dispute in your contract: Patient Information Sheet for BUPA Insured Patients Only. The British Orthopaedic Association, the professional body for Orthopaedic Surgery, have updated their good advice on the BUPA Arthroscopy review and included the General Medical Council advice on the dangers of the distant clinical review proposed by BUPA insurance. The BOA consider that BUPA Arthroscopy Review has put BUPA insured patients at a big disadvantage as many patients will be forced into distant review and later second opinions and with other surgeons that neither the patient nor their General Practitioner wanted to consider. For some patients, with knee problems requiring arthroscopy, delay could cause further harm. Referral by your insurance to a surgeon not experienced in knee arthroscopy could leave you with permanent injury. Many patients in the situation of finding themselves in an uninsured position have asked Mr Hardy or his staff to advise on the most comprehensive insurance available. Mr Hardy and his staff are not in the position of being able to offer financial advice of this nature.Mr Hardy considers his contract is with each patient he is asked to see for his professional opinion and not with their insurer. Mr Hardy follows best practice in that his contract of duty of care is with his patients (and not with any third party insurer selling Private Medical Insurance "PMI"). Click on the link above for his fair and reasonable fees for 2016. The table is based on the OPCS-4.5 classification which was mandated for implementation on 1 April 2009 by the NHS and system suppliers. These fees have increased in line with the same inflationary pressures that have guided the subscriptions for PMI noted above. Having discussed treatment options with Mr Hardy please telephone for a date for surgery and a letter confirming the fees. His secretary will send you a Surgical Fees Letter. Please check whether there is a difference between the amount you will receive from your insurer, according to the policy you have taken out, and the surgical and anaesthetic fees quoted. Many policies have not increased their fees in line with inflation OVER THE LAST 22 YEARS according to the BMA and leave the insured with large shortfalls they are not expecting. Some insurers have reduced levels of cover for common procedures. Mr Hardy subscribes to these Good Practice Guidelines regarding Copying Letters to Patients. Mr Hardy dictates his letters in front of his patients. This allows patients to decline a copy to their preferred address, correct perceived or actual mistakes and think of anything that might be included in the consultation. A copy of every letter he sends to a General Practitioner is also sent to the patient following consultation. As a result of this policy Mr Hardy believes he and his patients are rewarded with improved consultations, better understanding of treatment options and the chance to correct genuine mistakes in health records. Where you request clinical information from us that you are entitled to this will be transmitted back to your email address unless you explicitly request that we convey it through a different medium e.g. by post. Whilst Mr Hardy's team makes every effort to ensure its Internet infrastructure is secure, email is inherently unsafe and Mr Hardycan take no responsibility for transmitting data electronically. Medical details you send to us electronically for assessment of your condition, arrangement of appointment or any other purpose may be transmitted to Mr Hardy for his professional opinion. Mr Hardy will not provide a professional opinion through assesment of medical records without a physical assessment. However, he can use the data provided to assess the urgency of assessment and whether the assessment is appropriate for him to undertake.